I love that I get to influence you to buy a book whenever the Filipino Book Bloggers get together. :P I hope you love The Blue Sword! That and Beauty are my favorite McKinleys. Really interested to hear what you think of Seventeenth Summer. Great reads! I loved Sunshine and want to read more McKinley, but I’m wary because her other books are so different from Sunshine. I’m sure they’re great though. Yes, I’m sure they’ll be happy once I put them in a proper home. :) I asked my Mom when they were discussing renovation plans if I could have shelves made and she told me it was already a part of the new house plans. The amount of books I have surprised me, though! Holy cow! What a pile of books! (I’m completely envious) I hope you have a great reading week! I’m your newest follower. Drop by my blog and have a look at my list if you get a chance. Thanks for the follow, Barb! I am surprised at the piles, actually, but most of them were from my childhood. :) Some of them I might have to start letting go soon. NetGalley rocks :) I can’t wait to read Awaken! 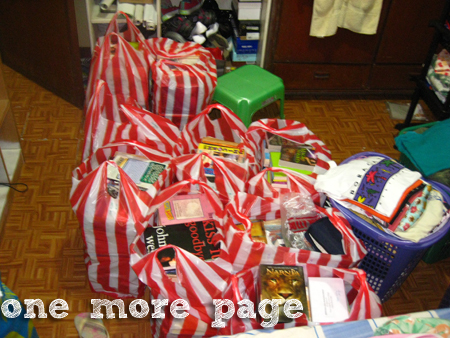 Hope the unpacking process goes well and that you enjoy all your new books! I’m super excited about Cryers Cross! You’ll have to let me know how you like it. You got Thr3e last week, right? That’s my first and favorite Dekker. :) Skin is one of his old ones that I never got around to getting until I found one in the bargain bin. That guy writes novels faster than people can get them! I’m super excited about Cryer’s Cross, too! The blurb sounds positively creepy, and I loved the Dreamcatcher series, so I’m hoping this one is as good! I’ve always wanted to read Dekker’s stuff but a lot of his apocalypse-y type of stuff seemed a little too dark and frightening to me. I saw the book trailer for all the color books, they were really well done! Oh some good looking books. I hope you enjoy! 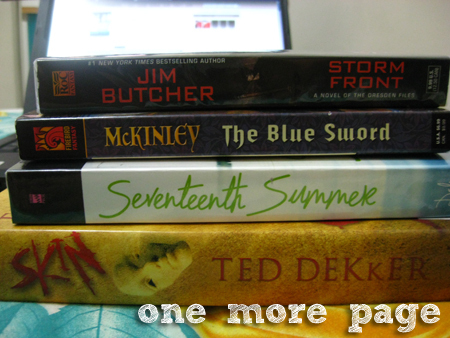 And Dresden Files Book 1!! I’m pretty sure Ariel will be extremely happy when he see that! Sorry I’m just getting back here! I’m swamped with work!! And everything else. And, now that you told me it’s a stand alone novel.. I’m more excited! Enjoy C.C.! I may get around to a Kindle soon, Netgalley is pretty hard w/o one. I hate reading on my laptop and I-Pod or I-touch. And refuse on my BB. Ugh. Maybe I’m just old school! ;) haha.